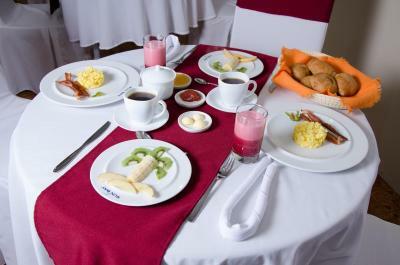 Lock in a great price for Hotel Palace Galapagos – rated 9.2 by recent guests! The apartment with the kitchen is dated and needs work but the other room that we stayed in was very nice. Their cheapest price rooms are tiny! The staff were great and helped out with whatever we needed. They went above and beyond to ensure our stay was perfect. Thank you Diego. Sonia cooked our amazing breakfasts. The food was delicious and the room was very elegant with classical music in the background. There was nothing the staff couldn’t do to please us. We were very impressed with their dedication. The walk to the waterfront was a short one but taxis anywhere in the town cost $1.50. Perfect all around Jose Miguel and Amy provided excellent customer service Excellent facility ! The staff couldn't have been more helpful & the AC room was so clean & it's almost a new hotel. It was in a quiet neighborhood but only a short walk into town. We booked this hotel based on customer reviews of the facility and the staff. We were not disappointed. Our entire experience was a 10+. Communication prior to arrival was flawless, facility was exactly as described and staff was amazing! They booked our tours and walked us to the shop to rent wetsuits. Felt like staying with friends vs. staying at an impersonal hotel. Excellent experience! This is a hidden gem four minutes from Charles Darwin Avenue. It is quiet, extremely clean, beautifully designed, and has the best staff. All of these qualities made this hotel one I would choose first above others on the island. The breakfast was amazing. Great to be so close to the beach, yet in a calm neighborhood like area. Got to ride bikes to see the sunrise in the morning, came back and we were greeted with delicious fresh fruit, yogurt, granola, eggs, and patacones a typical Ecuadorian dish. Rooms were very clean, and even had a blue light option to enjoy as we relaxed after a long day at the beach. Would highly recommend this to anyone!!! It was clean and the rooms were quiet. Breakfast was good. Even though I had to leave early in the morning, they packed breakfast for me to go. Excellent staff, went out of their way to help us in every way. Fantastic breakfast. Hotel Palace Galapagos This rating is a reflection of how the property compares to the industry standard when it comes to price, facilities and services available. It's based on a self-evaluation by the property. Use this rating to help choose your stay! 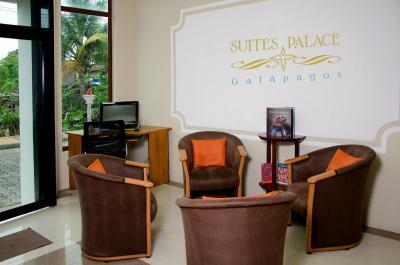 Hotel Palace Galapagos is located in central Puerto Ayora, 650 feet from a commercial zone and 0.8 mi from Charles Darwin Station. Buffet breakfast is provided free of charge. Each room here will provide you with free WiFi access, a TV with cable channels, air conditioning and a mini-bar. There is also a microwave. Featuring a shower, private bathroom also comes with a hairdryer and free toiletries. 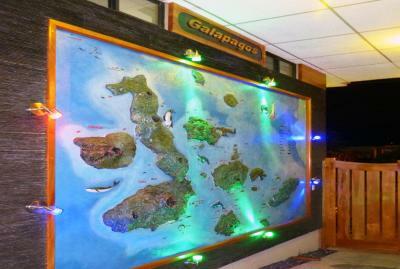 At Hotel Palace Galapagos you will find a reception with a tour desk. The property also has a water-treatment plant that uses ozone to create purified drinking water. An array of activities can be enjoyed on site or in the surroundings, including cycling, diving and fishing. Baltra Airport is 30 mi away. When would you like to stay at Hotel Palace Galapagos? 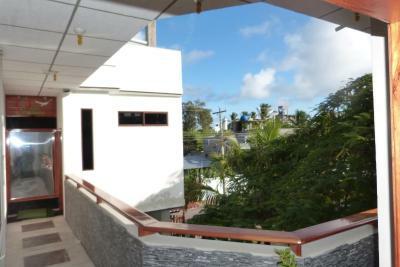 This 2-bedroom suite has a back patio, a kitchen and a living and dining area. This double room has a soundproofing, mini-bar and tile/marble floor. This double room has a tile/marble floor, mini-bar and microwave. This triple room has a private patio with a seating area, parasol and sun-chairs. It offers a wheel chair access. 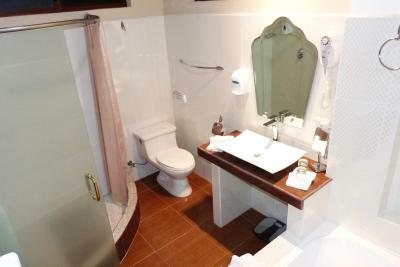 This twin room has a microwave, private entrance and tile/marble floor. This twin room features air conditioning, a private bathroom with a tub and a shower, a 32 inch LCD TV, a fridge and a microwave. House Rules Hotel Palace Galapagos takes special requests – add in the next step! Hotel Palace Galapagos accepts these cards and reserves the right to temporarily hold an amount prior to arrival. Please inform Hotel Palace Galapagos of your expected arrival time in advance. You can use the Special Requests box when booking, or contact the property directly using the contact details in your confirmation. The place needs updating and for the amount it charges, I think one expects more. The wifi didn't work in the room and the staff speaks limited English. The only thing that could have been better was the WI Fi which was incredibly slow - turtle net - and dropped in and out. This is not the hotel's fault as this is how the internet is in the Galapagos but whose complaining when you are in one of the best places in the world. The staff at the hotel were exceptional and could not have been more helpful and friendly. We were very lucky that Amy was working there during her University holidays as she spoke very good English and helped make our Galapagos holiday even better. Sonia and her husband who own and manage the hotel were also incredibly helpful but with not so much English. The hotel was an easy 10 minute walk from the main strip of Puerto Ayora so was away from the hustle and bustle of the restaurants, bars, travel and souvenir shops that make up the port. We had a two bedroom apartment which was amazing value. Breakfast was included and Sonia made a beautiful breakfast to order each day served in the restaurant. There was a kitchen in the apartment and Puerto Ayora has a very well stocked supermarket. Great place to stay if you are in Puerto Ayora. Make sure you walk past the fish market in the Main Street as there is an array of birds, a sea lion and iguanas just hanging around waiting for a free feed. No hot water in wash hand basin. Loo paper must be put in a bin. Barking dog across the street but he is quiet at night! Ferdinando was the kindest, most helpful of hotel managers. This is a small family hotel, very much a simple bed and breakfast. It is immaculately clean. Bathroom with bath and shower, though no hot water in the wash hand basin, and as is so often the case in Central and South America toilet paper must be put in a bin (yuk). Ferdinando will arrange tours, has many really helpful suggestions, and is happy to cater for specific dietary needs at breakfast. Everywhere is in easy walking distance in the town , and the taxi service the hotel organises with Andreas is also excellent. Better wifi would have been nice. We could send and receive emails but that's about it. Seems to be on par with the Islands themselves, but the ability to Skype would have been nice. Nothing but the absence of the English-speaking reciptionist. It is really hard to communicate between a Spanish-speaking hostess and an English-speaking guest. I stayed here for 3 nights. Sonia, the general manager of the lovely place, has a pair of beautiful eyes and a warm heart. Even though she can barely speak English, she tried her best to make me feel at home during my stay with the help of her sister and the translation app. The room is cozy and the breakfast is tasty and healthy as well. The location is not very close to the pier, but it takes no more than 8 minutes by walk. The neighberhood is quite safe even for a girl to walk alone at night.